The Navy wants to step up special-operations training at state parks along Western Washington coastlines, releasing a proposal that would more than quintuple the number of sites. The Navy currently has a permit to conduct exercises at five state parks. The preferred option in a planning document calls for the possible use of 29 parks ranging from Cape Disappointment at the state's southwest tip to Deception Pass in northwest Washington. In addition to the parks, the Navy is considering private lands as well as other public sites such as the Port of Anacortes, a Tacoma wastewater plant and a closed prison on McNeil Island. 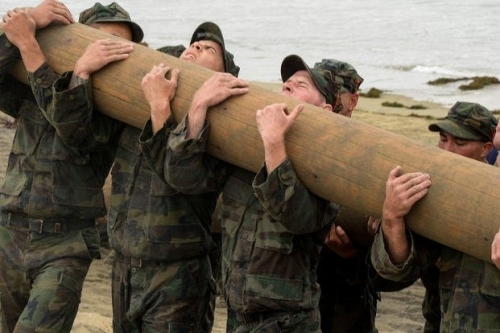 This is part of a broader push in recent years by the Navy and Army to increase the scope of training activities in Washington, an effort that has stirred criticism in a state with a tradition of environmental and citizen activism. Most of the Navy training would unfold at night, often involving submersible diving vessels and SEAL swimmers stealthily coming ashore and making their way to designated locations. That might be quite a spectacle for a camper walking a nighttime beach, but such glimpses of the SEALs are supposed to be rare. "The whole point of this is to do it without being seen," said Sheila Murray, a public-affairs deputy at Navy Region Northwest. Murray said the training will help prepare the SEALs for secret missions in hostile territory where getting spotted from shore could have deadly consequences. But to train in more parks, the Naval Special Warfare Command first needs permission from the state Parks and Recreation Commission. So far, the Navy has yet to submit a permit request for the commission to consider. "Their assessment just puts out all the various activities that they could want included," said Virginia Painter, a spokeswoman for the states Parks and Recreation Commission. "That doesn't mean that those activities are going to happen ... We would be concerned about anything that would affect the visitor's experience, environment and safety." The SEALs -- Sea, Air and Land Teams -- are elite forces that have been involved in some of the military's most high-stakes covert missions, such as the 2011 raid on a compound in Pakistan that killed Osama bin Laden. The draft document calls for both "small-unit land and cold-water maritime training activities." In the Puget Sound training area, the preferred option calls for six blocks of training a year -- each ranging from two to eight weeks in length and involving up to 84 trainees and support personnel. That would be a tripling of the current level of such activities in that area. Support personnel would use radio communications to help alert other vessels of an active dive site, and "safety buffers" would keep civilian craft at a distance. The land activities would include hiking and observing "military role players" while hidden. There would also be simulated building clearances that would involve modified weapons firing pellets emitting dime-sized splashes of paint, but these would not be used in any of the state park locations, according to Murray. Murray said the training would not interfere with normal park operations. Opponents disagree and say public parks should not be used for military training. They question whether maritime exercises could prevent recreational boaters from landing at a park, and whether campers could be put on edge by SEALs sharing the park space. "The Navy has said you might wander unaware into a secret military exercise," said Karen Sullivan, co-founder of West Coast Alliance, who said this was stated at a recent public meeting in Port Townsend. "What happens if this goes on at night, and someone, who is armed, responds." Sullivan is a former U.S. Fish and Wildlife Service biologist who has helped to organize opposition to military-training activities that include anti-surface and anti-submarine warfare in Puget Sound and electromagnetic-warfare exercises on the Olympic Peninsula. There also has been a backlash to the noise generated by Navy EA-18G Growlers based at Naval Air Station Whidbey Island as they practice landings and takeoffs, and a Navy proposal to grow that fleet from 82 jets to as many as 118 aircraft. Sullivan thinks the Navy park-use proposal could violate state laws that prohibit intimidating conduct and activities that disturb the public at state parks. She is now organizing a letter-writing campaign to state officials to protest the Navy plan for special-operations exercises. The Navy has deep roots in the Puget Sound region, with Naval Base Kitsap, home port for ships and nuclear submarines, ranking as the third-largest Navy base in the United States. Puget Sound has been a Navy training area for some seven decades. For years, the SEALS have conducted cold-water training in Puget Sound, and some parks were occasionally used for what Painter said was "very limited activity." Then in 2015, this occasional use was formalized through a five-year, right-of-entry-permit that allows training at Blake Island, Fort Flagler, Illahee, Mystery Bay and Scenic Beach state parks. The document calls for park officials to get at least three days' notice before training, and for the Navy to "minimize, and avoid if reasonably possible, any interference" with the use of these sites as parks. Painter said that the training activities at the parks have been small undertakings, sometimes involving just one trainee, who is then picked up from the shoreline by support staff. This use has sparked complaints from park visitors, according to Painter. Expanding the Navy footprint in the parks increases the possibility of conflict. But the Navy planning document says the current training is too limited. It fails to "provide sufficiently varied and diverse training locations or physical environmental features, and lacks elements unpredictability and unfamiliar," according to the planning document. In an effort to explain the new proposal, the Navy held three Western Washington public meetings. � Copyright 2018 Seattle Times.